Artist Dixie Salazar: When I ran across this image in a vintage child’s coloring book, I was immediately struck by the irony on so many levels inherent in this image. Gun advocates say that guns are for protection, but children continue to die because of collateral damage during wars and access to guns in our environment. I think the image and the words speak for themselves. We continue to program our youth to wave the flag in the name of a country that does not support them in so many important ways. I added the children’s drawings as an additional level of irony. Poet Jonathan Baxter: Ms. Salazar’s artwork immediately reached out and grabbed me by the throat. Since I’ve become a parent, images of children in harm’s way particularly touch a nerve with me, and her art certainly did that. Her juxtaposition of a child’s innocence and imagination with images of political propaganda and war violence was very effective and resonated with concerns I have about one day having to explain the concept of war to my children. I do not know how I’m going to have that conversation yet, and my poem explores the mixed feelings I have about approaching that subject with them. Artist Dixie Salazar: I was not really too surprised. I think the poet very much understood what I was trying to accomplish with the piece. Artist Dixie Salazar: I think art speaks in ways that the media and other outlets cannot. I am currently in Cuba and am amazed at the important role that art has played in the development of this society. Artists have always been the voice of conscience in any society that would seek to suppress freedom of ideas in overt or covert ways. Art can get around things. Strong images and poetry can touch people’s hearts as well as their minds. Poet Jonathan Baxter: I immediately think to Shakespeare’s line from Hamlet: “They are the abstract and brief chronicles of our time.” He’s referring to actors, but I think he could be talking about any artist. Artists observe, reflect, and then communicate unique perspectives of our world to their audiences. Good art can transcend racial, cultural and political divisions by touching the chords of humanity we all share. I certainly wish, especially now with the current climate in this country, Americans could take a moment to pause, reflect, focus on our shared humanity, and begin communicating. I certainly feel artists can contribute more to this end then the politicians, pundits and polemicists can with their rhetoric. Artist Dixie Salazar: In my case, I would hear a child playing “Chopsticks” on a toy piano, with the firing of guns or other war noises in the background. Poet Jonathan Baxter: That’s an interesting question because I sought to find musical motifs in my interpretation of Ms. Salazar’s artwork. Her imagery made me think of martial music, such as the drums and bugles used to communicate to troops in historical battles. The bugle calls would rise above the din of the conflict and provide a call to order in the chaos. That imagery synced for me with her visuals of flags in the background of the frenetic firestorm of color that burns through her artwork. I tried to touch on such acoustic cues in my treatment of her artwork and include musical symbolism in my poem. 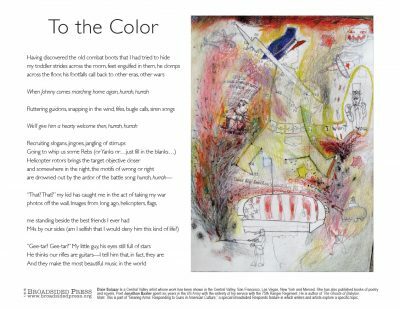 The title, “To the Color,” is the name of the bugle call that is still played today at US military installations upon the lowering of the flag at the end of the day. Artist Dixie Salazar: I would like to mention my novel Carmen and Chia Mix Magic a young adult fantasy novel in which Hmong and Mexican female protagonists become friends to retrieve the brother who has been captured by the evil ICE. They have to put together magic from two cultures to protect themselves and fight the evil forces threatening their families. My goal was to write against the genre in order to avoid a huge battle at the end where good wins out over evil. lt was a challenge to not use violence to achieve good outcomes. Poet Jonathan Baxter: Mark Bowden’s Hue 1968: A Turning Point of the American War in Vietnam was the best book I read recently. It is an extremely vivid and well-researched account of one of the most significant battles of the Vietnam War. I’m also reading and re-reading the poetry of Dylan Thomas, Wilfred Owen and Rudyard Kipling right now. Artist Dixie Salazar: In this current climate facing our country, the importance of artists cannot be emphasized too greatly. But I also think we have to actively involve ourselves in local and national levels, through activism and in any way we can. We are at a point of crisis, and it may just not be enough to only make art work right now. Poet Jonathan Baxter: I just finished Ken Burns and Lynn Novick’s documentary The Vietnam War on PBS. It succeeds in being both a highly informative history lesson as well as a beautiful work of film art. Poet Jonathan Baxter: I was immediately drawn to the subject matter of this special issue. Guns for me are tools and merely extensions of humanity’s capacities for good and evil. The root issue for me was violence, especially the violence on a mass level that is warfare. I’m not offering any answers, just a perspective. The more perspectives we can share, and in turn, discuss, the more we can possibly deter future conflicts. It’s an unrealistic aspiration, but a hopeful one. Dixie Salazar is a Central Valley artist who has been working in oils, watercolors, collage, assemblage, and hand-colored photography for the past forty years or more. Her work has been shown in the Central Valley, San Francisco, Las Vegas, New York and Merced. She has also published five books of poetry and two novels. Image: “Does Big Brother’s Uniform Fit Johnny?” mixed media. “Jonathan Baxter” spent six years in the US Army with the entirety of his service with the 75th Ranger Regiment. His first volume of poetry, The Ghosts of Babylon (Blackside Publishing, 2016), is a reflection on his experiences in Iraq and Afghanistan. He continues to deploy to the Middle East as a private security contractor. His website can be found at www.mercenarypoet.com.